All-purpose haulers for hunting gear and more. These French Military Surplus Gas Mask Bags are handy and easy to haul around. 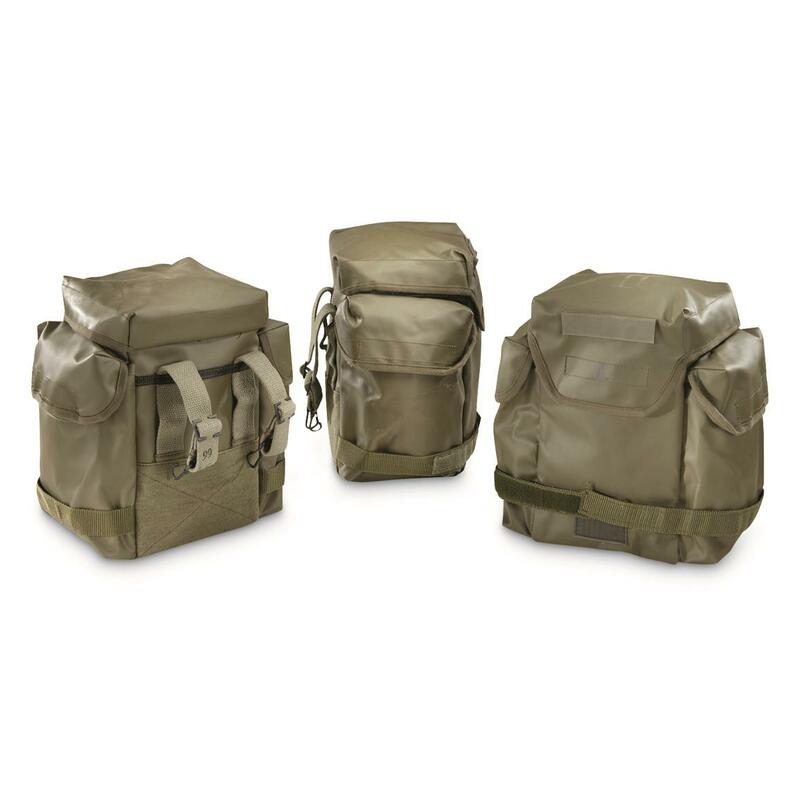 Each Bag in this 3-pack comes with a main compartment with grip-strip closure and two flapped side pockets to keep smaller essentials organized. You'll have an easy and convenient 536 cu. in. of storage space. They're simple to carry, too. Each has two belt loops that will accommodate belts up to 2.75" wide, or clip it to a GI belt. It has a bottom leg strap that will fit around a leg 32" in circumference. The heavy-duty vinyl-coated canvas will stand up to abuse and you'll find plenty of uses for them whether you're at work or play. Size: 7.5" x 6.5" x 11"h.
French Military Surplus Gas Mask Bag, 3 Pack, Like New is rated 4.9 out of 5 by 10. Rated 5 out of 5 by Brad25 from Functions Well as Mess Kit Storage I purchased these to store NATO Military Surplus Mess Kit and have not been disappointed. Fit is perfect and interior pockets serve well for utensils and seasonings. Exterior pockets are perfect for fuel storage or MRE's. Straps are set up well to attach to the exterior of a large backpack. Rated 5 out of 5 by Joe AZ from Great bags at a great price. Great bags. Pretty heavy but they will weigh a lot more if you fill them up! These are big bags. My three were issued but pretty close to new. Can be used as a shoulder bag with addition of a strap attached to the existing snap hooks on the short straps on the back of the bag. The main pouch and side pockets close up tight enough to keep even a hard rain out. Each side pocket will easily hold 2 one liter water bottles or a USGI canteen with cup, stove stand, insulated cover and a fire kit. If you carried water bottles in both side pockets and the main pouch you could get 14 or 15 liters total. Two or even four of them would make an excellent set of bike saddlebags. I am using one of mine for a walkabout shoulder bag. The second one holds my truck camping kitchen with room for food. The third holds spare clothes in my truck. I may have to buy more. They are a good buy. You should get some. Rated 5 out of 5 by Earl from good price and quality all 3 looked almost new.study enough to carry ammo with side pockets to carry my AR15 mags. Rated 4 out of 5 by desertdude2 from Great Bag for Mtn Bike Perfect size bag for handle bar bag on my fat tire electric bike. Or I can strap it to my cargo rack on the rear. Can put a lot of stuff in to keep out of the elements. Rated 5 out of 5 by darth brando from amazing absolute bargain on price, quality was pristine on all 3 bags i got, one bag has some sharpie inscriptions on it but the previous issued owner took great care of it. the hook n pile tapes on all bags to my amazement is all still pristine and functional. note these bags are vinyl and a bit heavy but if you need some water proof all weather bags for gear these are phenomenal. like any gas mask bag they clip into LBV or IBA or carrier/tac vest and the loops are for attatchment to belt or dropleg panel so it doesnt bounce around. these are a bit bulky but that simply means you can store more things in them. the side pouches btw ARE big enough to hold 1qt canteens with covers so note the storage on these are massive. each pouch also has its own drainage eyelet in the event water does find its way inside. Rated 5 out of 5 by PaddleHikeCamp from Great for intended use & the price. They are sturdy & well made, clean & in good condition. Only rated 4 rather than 5 because they are too big for use as a belt pouch, IMO, even though that seems how they were meant to be used. I ordered them because they are three stand-up, "square" containers (rather than floppy bags) to keep camping supplies clean & organized at home or in my truck. 8 Sacks, 1 low price! Each 41" x 28", 1.5 lbs. For bulk storage or custom projects!